The African Black Rhino is a magnificent animal whose ancestors have roamed the earth for 60 million years. Now, tragically, this mighty creature has come dangerously close to the end of the trail. 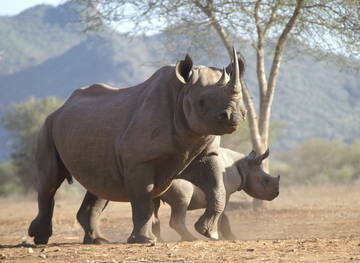 Only a couple of decades ago there were still perhaps as many as 65,000 black rhino in Africa. Today, fewer than 3,000 are left and every survivor lives with a price on its head. The rhino's downfall has been brought about by the value of its horn. In some Arab countries these horns are carved into dagger handles. In Yemen, a single horn can fetch up to $85,000 on the black market. The largest and most consistent demand comes from Asia, especially Taiwan, South Korea and mainland China, whose traditional pharmacists promote powdered rhino horn as an analgesic. There it is worth more than twice its weight in gold. In the late 1960s, as many as 250 East African Black Rhino roamed wild in Mkomazi. By the late 1980s there were none left. But, today, with the help of the George Adamson Wildlife Preservation Trusts, the Black Rhino has returned to Mkomazi. 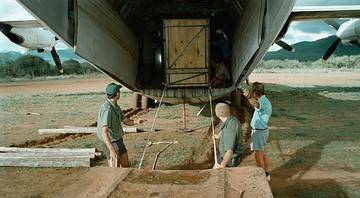 In 1997, after five years of development and construction of the Mkomazi rhino sanctuary, and careful planning between the trusts, the South African National Parks and the Tanzanian Government, the first translocation of four East African Black Rhino (D.b.michaeli) from South Africa to Mkomazi took place. 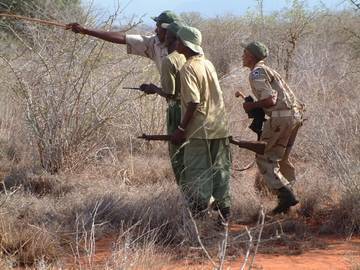 In 2001, a further four rhino were translocated from South Africa to Mkomazi. The eight resident rhino have settled down and are in magnificent condition. Separation fences were constructed within the sanctuary to facilitate the introduction of the original resident rhino to the newcomers. The sanctuary was designed to take a founder population of twelve animals. 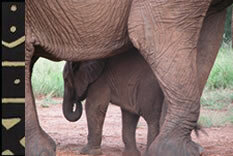 Breeding is a lengthy process, and in other sanctuaries can take between four and seven years to start. We hope to increase the number of rhino by a further four, which we hope will help to encourage and fulfill breeding potential. June 2009: Three black rhinos (subspecies Diceros bicornis michaeli) were donated to the Director of Wildlife, under the care of the Mkomazi Rhino Sanctuary and the Trust, by the Dvur Kralove Zoo, Czech Republic (see here for fuller details). A short video of highlights can be seen here (click on the arrow that says "Bekjik de film van het transport"